What is a .estate Domain? The .estate domain is a generic top-level domain that was first delegated in 2013. Like other gTLD, it was created to give businesses and website owners a more expressive alternative to a traditional .com extension. It’s an ideal naming solution for anyone who works within the real estate industry. Since its introduction, it has been adopted many types of businesses that are affiliated with the buying, selling, or planning of property. 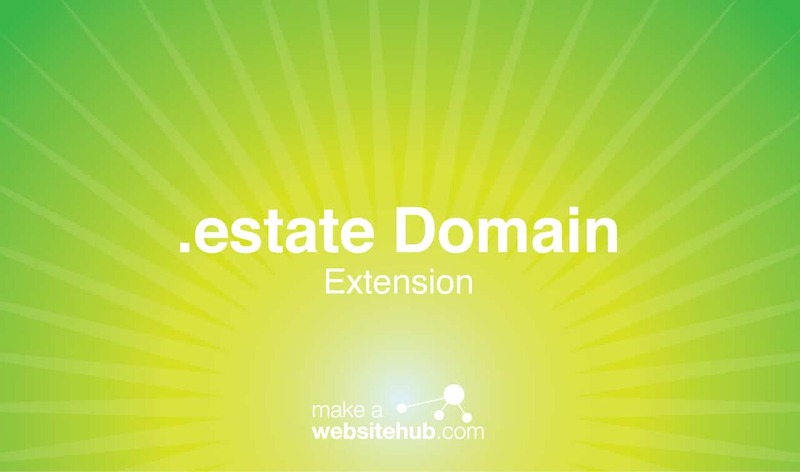 Whether you’re a real estate broker, probate lawyer, or simply a property owner looking to advertise your space, the .estate domain extension can serve you well. Why Choose a .estate Domain Extension? The biggest reason you should go with a .estate domain is its instant connection with the world of real estate. Having the extension as part of your website’s web address creates an automatic connection with Internet users. They’ll know what your website is about and what your company has to offer before they even visit your site. It’s a relevant extension that also offers a sense of credibility. Anyone can use a .com extension and pretend to be a licensed professional. However, a .estate extension shows that you have gone the extra mile to convey a sense of professionalism with your Internet presence. The extension also provides some very practical benefits. It can ultimately help drive more traffic to your website because it’s automatically optimized for search engines. An important keyword for your industry is built onto the domain extension. This can help your website appear higher on search engine result pages for those who are looking for your types of services. Generic top-level domains, such as .estate, are meant to be used creatively. They provide owners with more expressive means to tell the world what they’re about. The .estate domain extension is very easy to use creatively. Many real estate firsts employ domain hacking techniques to create URLs that look great on business cards and advertisements. For example, you could use something like LocalReal.estate or CompanyNameReal.estate. Both of these examples incorporate terms that are SEO-friendly and very memorable. Where Can You Buy a .estate Domain Extension? Registering a .estate domain is a quick and easy process. Since it was first made available to the general public, it has been in high demand by real estate-focused entities. It’s offered by many of the biggest domain registrars. Here are just a few that you may want to check out. The good news is that the .estate domain is very flexible. While it is predominantly used by those who deal with real estate business, it’s open to anyone. There are no use restrictions other than the standard naming guidelines that come with all generic top-level domains. It’s available for private registration and can be registered for up to 10 years at a time.